Three writers, a Kenyan and two Nigerians are in Iseyin, Oyo State for the May/June 2018 Ebedi Writers Residency Session. They are; Troy Onyango, Socrates Mbamalu and T J Benson. Troy Onyango is a Kenyan writer and Lawyer. His fiction has appeared in various journals and magazines including Transition Magazine Issue 121, for which his short story 'The Transfiguration' was nominated for the 2016 Pushcart Prize. His short story 'For What Are Butterflies Without Their Wings?' won the fiction prize for the inaugural Nyanza Literary Festival Prize. He was shortlisted for the 2016 Miles Morland Foundation Scholarship. He is a Founding Editor of Enkare Review – a Nairobi-based literary magazine and the Fiction Editor of the East Africa issue of Panorama: The Journal of Intelligent Travel. Troy will be using his time at Ebedi to complete work on his novel, tentatively titled The Sound of a Dream. 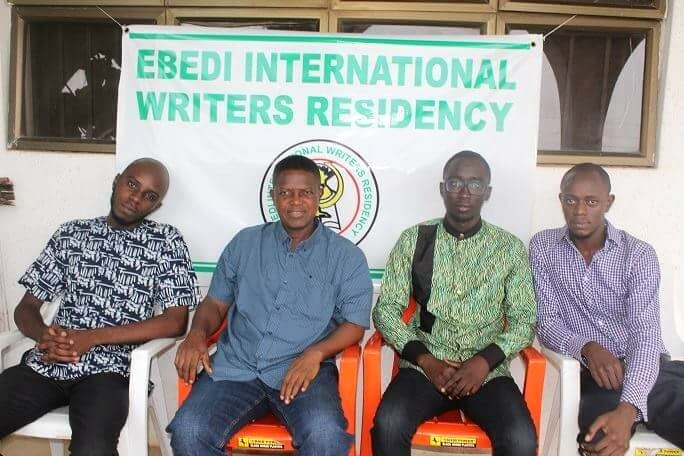 He will also mentor secondary school students in Iseyin in the area of fiction writing. Socrates Mbamalu is a Nigerian writer whose works have appeared in Saraba Magazine, Deyu African, Kalahari Review, African Writer. Sankofa Mag alongside other magazines. He has participated in two editions of the Writivism workshop and was recently shortlisted for the Saraba Nonfiction Manuscript. He was commissioned by the Commonwealth Writers for a piece titled ‘The Lives of Trailer Drivers’, which was published in November 2016. He is a book reviewer for Olisa TV and has written a couple of articles for Waza Africa. To him, words are magical, the very foundation upon which the world stands. Socrates Mbamalu seeks to keep outdoing himself with every work he produces. Mbamalu wishes to use his time in Ebedi to complete work on his new novel. He also wishes to learn from the Iseyin environment and interact with the locals. He would also mentor Secondary students in the Iseyin community by helping them in English language and they in turn improving his Yoruba. He will also encourage them to read more, through the organization of reading classes. Tee Jay Benson, the third writer is a Fellow of the Ebedi Residency having attended a previous edition a few years ago. He has among other things worked as an Editor and Columnist for Aspire.org.ng, MGE UK Men’s fashion magazine, Afrisphere.com and Kaanem.com. He has also participated in the Yasmin El Rufai creative writing workshop and First Bank Naked Canvas Competition. He was commissioned in February 2015 to produce a collection of photography and poetry titled ‘Self’. A prodigious writer, Benson has been published in Kalahari Review, Munyori Journal, Sentinel Magazine, Paragram UK, Contempoary Literary Review Of India, Jalada Africa, African Hadithi, Expound Magazine, Transition Magazine among others. In September 2015, he completed ‘’The Devils Music’’ a collection of prose, poetry and parables and won the Amab/Home of Books Foundation flash fiction Contest in 2016. That same year, he won a publishing deal with Saraba Magazine to produce a novel; ‘’The Madhouse’’. Tee Jay Benson will use his time in Ebedi to complete a new manuscript as well as mentor students in Iseyin Community in the areas of public elocution and creative writing. very good article. I am happy to be able to come to this website. Do you need a uniform? contact us jasa sablon jogja for your uniform production! Hello friends, introduce us cetak kaos ready to serve in making your shirt. Immediately visit the link. Hello friends, introduce us tempat sablon kaos terdekat ready to serve in making your shirt. Immediately visit the link.